To begin discussing Phoning Home, I have a few key phrases for you I hope will capture what it’s like to start this compelling Sci-Fi journey. Thrusters On! Pterodactyl Screech! Robot With-A-Club! Fire! It's a whirlwind of activity and discovery that greets players when they step into the role of ION, an exploration robot that has found itself – himself?—stranded on an unknown planet. Accompanied, at first, only by the voice of his companion and advisor, EU_18TR289x65 (EU, as we'll call him), ION must secure the items necessary to contact their mothership. 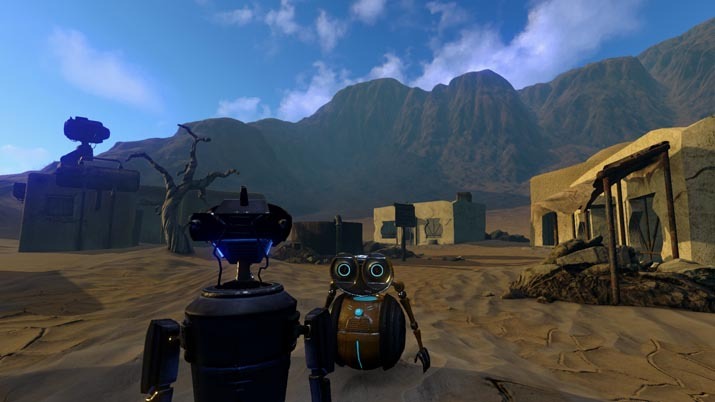 In what feels like a tribute to E.T., one of the most famous lovable-alien tales of all time, ION LANDS has developed an exciting, immersive trek into the story of some wayward robots. Fluorescent flora and fauna glisten beneath the canopy overhead, serving as small, shimmering spectacles that beckon to ION from a modest distance away, promising valuable resources. 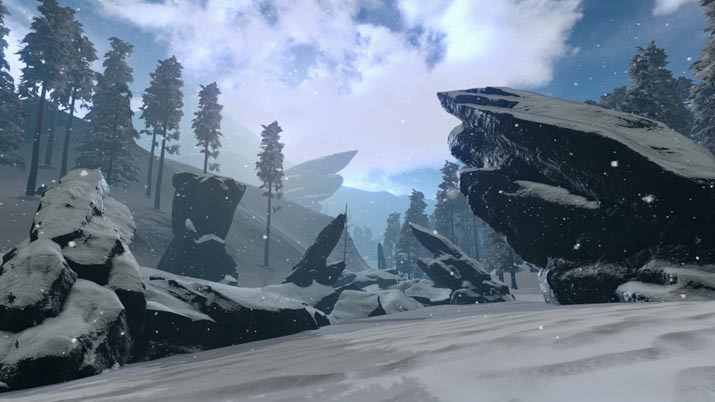 Rocks, seeds, roots, and discarded fragments of machinery are scattered here and there, the components for tools that are critical to ION and ANI's survival. Suddenly, thunder booms in the distance, and the sound of rain trickling down from the sky creates a surreal and serene environment, one that feels all the more authentic thanks to the effect of water streaking down the in-game camera lens. Phoning Home does a remarkable job of establishing novelty as a Survival game, but one with an Artificial Intelligence (AI) protagonist. Instead of fleshy, blood-splattered combat, and the dire need to find food and water, ION's at risk of running low on fuel, damaging his metallic body with fire or falls, or encountering organic wildlife with the means to pry him apart. It is a saga that begins with walls of fire and foreboding shrieks from a winged, prehistoric beast in the sky, and progresses to include ravines of lava, the hazard of sandstorms to metal bodies, among other obstacles. The creatures that ION and ANI encounter aren't limited to just standard Sci-Fi fare, but instead are a blend of fantasy tropes, dinosaur-era beasts, and futuristic marvels. While the graphics immediately sell Phoning Home as a quality Exploration game, the accompanying audio is fantastic. The voice acting is superb – particularly in the case of EU, ION's witty guide and the player's tutorial instructor. The soundtrack is riveting and perfectly suited to the atmosphere, with the chittering, churning, billowing sounds of a living world around them. This title makes Exploration of an alien frontier a pure pleasure. Without a doubt, Phoning Home is full of nostalgic charm, considering that for many of us ION likely triggers memories of the film Short Circuit from the 80s, mixed with the more modern hit, WALL-E. But those qualities pale in comparison to the appeal of the sleek, clean interface and intuitive controls, and even the (somewhat) simple crafting system within Phoning Home is a treat compared to the boggled-down, cluttered mess present in many Survival series. Of course, the Crafting aspect of this title means that resource management, gathering, and initial discovery plays a huge role in the experience; ION immediately is in need of the most basic supplies, such as fuel and hull repair pieces, and as the story progresses players gain access to additional recipes. Once ANI joins the party, her inventory and needs are also managed by ION, and while this could have felt clunky or repetitious, it is streamlined here in a way that makes it fun rather than obnoxious. I was concerned, at first, that adding an NPC companion like ANI to the mix – especially when I immediately had to navigate with her over steep cliffs, narrow passageways, and across hazardous ravines – would feel like an unnecessary chore, but it works. Besides, ANI is a sweet, amusing character, and it doesn't take long for her to endear herself to both ION and, hopefully, the player. At times, resource gathering slows down the flow of the game, and there was a sizable amount of backtracking required at certain points as recipes became more and more complicated. It wasn't enough of a problem to ruin the Exploration aspect of Phoning Home for me, but it did skirt the line between being a necessary evil, and an unnecessary expenditure of my time. The Quest system is more of an elaborate, easy-to-use and comprehensive journal of tasks, and I rarely found myself uncertain of what to do next. EU would update ION on upgrades and new features as I unlocked crafting recipes, and he would add markers to my on-screen compass for easier navigation. Once you discover a resource in Phoning Home, an icon for that particular material shows up on your compass radar; this cut down on my floundering tremendously, and it's an invaluable tool when you're searching for one more piece of roots or a crystal fragment. Phoning Home is an excellent example of what happens when developers think outside the box of their genre(s). While there are dozens of Sci-Fi themed Survival game option for players to choose from, ION LANDS has blended a remarkable combination of elements to create a saga that stands out from the crowd. ION is a protagonist worth rooting for, even without a single spoken word, and the fact that he has so much charm reflects on the storytelling here. ANI is an excellent addition as ION's sidekick and charge, and I enjoyed trying to keep her safe – it certainly gave me numerous opportunities to consider obstacles from a new angle, knowing that I had both ION and ANI's limitations and abilities to factor into the equation. Plus, EU is a quirky member of the cast, and his dialog was entertaining rather than redundant or overwhelming. The biggest challenge that Phoning Home faces comes down to the persistent glitches. ION's maneuverability isn't his strong suit, but this is compounded tremendously by his tendency to occasionally glitch through the world around certain terrains, or his common hindrance of getting trapped inside rocks and landscape. At times, ION's mechanics, specifically the jets that he uses to "jump" and fly for limited times, proved to be a source of frustration. These issues with glitches, especially when it comes to obstacles, likely made this feel more irritating than it might have without those bugs being present. However, once these issues are resolved, the beautiful, inviting world at ION's robotic fingertips will be that much more enjoyable, ready to conjure memories of E.T. and Flight of the Navigator – or to potentially introduce those themes to a whole new audience. There's a lot to love, between this memorable cast of AI characters, and the creatures, resources, and storm patterns of this alien world, and I certainly enjoyed my visit to this gorgeous landscape full of hazards and mysteries.